Now that September’s here it’s time to look back at my August reading. I read eight books, which seems to have been about average for me this year. I started the month with Seventy-Seven Clocks by Christopher Fowler. I’m slowly working through Fowler’s Bryant and May mysteries and this was the third in the series. My second book in August was In a Treacherous Court, a historical fiction novel by Michelle Diener which introduced me to two little-known characters of the Tudor period – Susanna Horenbout and John Parker. I enjoyed it, although it was a very light read. However, my desire for something deeper and more complex was satisfied by Race of Scorpions, the third book in Dorothy Dunnett’s House of Niccolo series. This was one of my two favourite books of the month – the other was The Scarlet Pimpernel by Baroness Orczy which I loved and wished I hadn’t waited so long to read! I also re-read Emma by Jane Austen and was pleased to find that I enjoyed it much more than I did the first time I read it! And then I read The Dog Stars by Peter Heller, a post-apocalyptic novel – definitely not the type of book I usually choose to read, so it was an interesting experience! Finally, in the last week of August I decided to read two of the shorter books on my Classics Club list, The Princess of Cleves by Madame de Lafayette and The Prisoner of Zenda by Anthony Hope. As usual, I have not had time to post my thoughts on all of these books but will try to do so within the next few weeks. 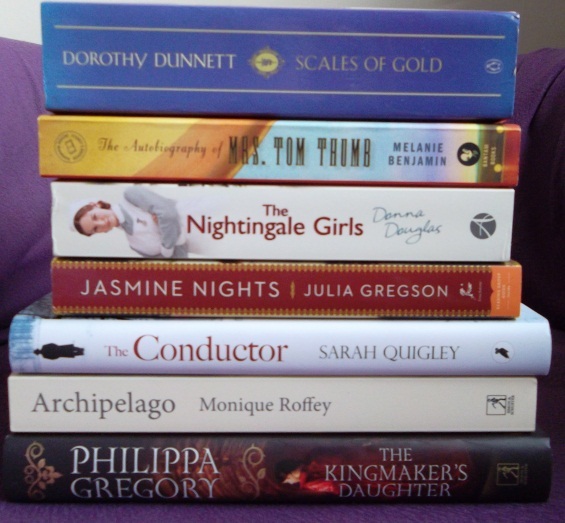 I’m still trying not to buy any new books so most of the above are review copies, apart from Scales of Gold. Have you read any of them? Did you have a good August? What are you hoping to read in September? A good mix of books! A couple of authors I recognise, think I need some Bryant and May in September, lots of blogs reading them. I have one on the shelf ready. But then I must get on with the White Queen to catch up with Philippa Gregory. Oh but then there is work….. I hope you enjoy The White Queen when you get to it – I’ve read all the books in Philippa Gregory’s Wars of the Roses series and I think that one was my favourite. Oh, I love Pride and Prejudice! I put it on my Classics Club list too for a re-read as it’s been such a long time since I read it. Hope you have a good September! I hope so! I remember reading your review of it and thinking that it sounded fun. I haven’t heard of most of the books in your Acquired pile so I will be interested to hear what they are all about. I read five books in August and my favorite was A Glass of Blessings by Barbara Pym. I’m hoping to read a fair chunk of Anna Karenina in September as well as The Shooting Party by Isabel Colegate. Happy September! I must read something by Barbara Pym soon! I’ve been meaning to read Excellent Women for ages – maybe it’s time to move it up the tbr pile. Oo, I’ll be interested in reading your review of Princess of Cleves, I’m assuming it’s about Anne of Cleves? Eight books in a month is pretty awesome, I’m rather envious! I’ve a sort of plan to read David Copperfield this month, a hope but with an awareness that it likely won’t happen for it’s length. I had thought The Princess of Cleves would be about Anne of Cleves too, but it’s actually about the marriage of a French heiress at the court of Henri II of France. I’m hoping to post my review of it next week. Oh, and good luck with David Copperfield!